This modern lake home located in the Steiner Ranch community of Austin Texas features a $152K custom AV system designed for the client to include up to 20 distributed audio zones, 12 distributed video zones, a custom 4K theater, lighting, HVAC, security, pool and intercom. All system hardware is located in a centralized dual rack closet on the 2nd floor behind the home theater. Control over all Audio, Video, HVAC, Pool, Security, and Intercom systems is performed with the custom user interface on either of the Crestron 10″ in-wall touch panels located in the Kitchen or Master Bedroom. The client can also control the same interface via the Crestron App installed on 2 roaming iPads. 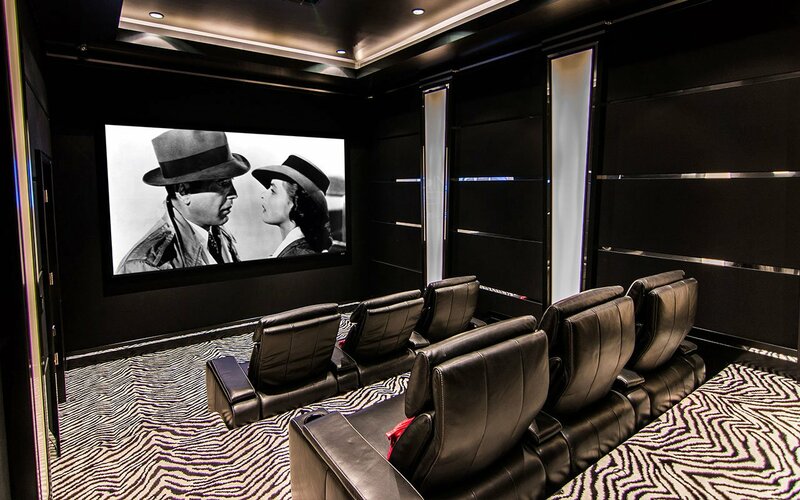 The theater was a main focal point for the clients. They had a specific design in mind so we worked with a third party, Cinema Tech, to design the theater the client had envisioned. This truly is a spectacular home and property that is meant for entertaining.